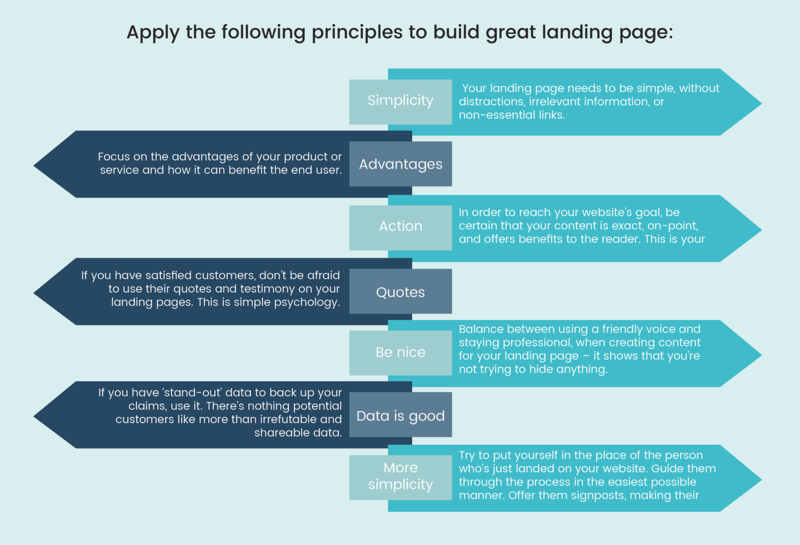 While making a Landing Page, there are certain components which must be kept in mind in order to get excellent results. Your landing pages are an important part of the website design and development and aiming to attract visitors and further converting them to customers. The content of your landing page must be to the point which should highlight your unique value proposition. The content should provide the details about the product or service you’re selling. Your content should be very compact as you only have a few seconds to convince your users and also convert them to customers. Always use plain language while convincing your audience. A powerful heading creates a very powerful impact on your page. It’s your first opportunity to influence your visitors and convert them to customers. Always use a heading that clearly tells about the benefits of your product or service. Also, your heading should suggest the visitors what exactly they can get on your landing page. After providing a proper and relatable heading list all the benefits of your product or service using bullet-points. This will help your visitors to learn about your product or service and will help in building a positive trust. The layout of your landing page should be very simple and attractive. Use a clean design with proper images and call to action. Also, make sure your design doesn’t increase the page loading time. Сheck the layout of your page at different resolutions to make sure that even people with older monitors will be able to see your heading and call to action without scrolling. And be sure to check how your layout is displayed on mobile devices. Always provide a call to action buttons which allows the users to contact, sign up, request a demo. A call to action button must be present on the top as well on the bottom of the page so that users do not need to scroll up and down for inquiry. Also to attract your visitors make animations in your call to action button. Also, the message in your call to action should be related to the heading of your landing page. Always create forms on your landing page as it may help you in lead generation. While creating lead generation form keep your forms short and ask for only essential information. Users don’t mind providing their Name and phone no. but asking for irrelevant information like DOB may stop visitors from filling out the form. Always include social sharing icons so that your customers can promote your brand. Always use the popular social media platforms that your target audience uses. Be sure to add an email forwarding option, since people still like to share things by email. These are some of the points that needed to be kept in mind while creating a landing page and also it is recommended to test time to time whether they work well with your landing page. There are some factors may work well with your page while some may not. Look for the best ideas and create a perfect Landing page. Also, you can take help from Best web development and design company who will provide the right guidelines.